CHINA - A time for recollection and contemplation for the Chinese Pig Industry in the Year of the Chicken, writes Alexander Kovachevich, GM China Area, Genesus Genetics. According to the Chinese Zodiac, 2017 is the Year of the Chicken. While the chicken sign is seen as quite a positive sign, with attributes such as loyalty and persistence, it is commonly said that one’s ‘own year’ (本 命年) is a difficult one. When looking at consumers’ consumption habits of protein, we look at three ‘competing’ groups, eggs, chicken meat and pork. High prices for one generally leads to people choosing more of the other. While pork prices have been high for over a year, one could assume that the pork industry will face a tough year in 2017, but from what we understand this will not be the case. In general, 2016 has been an extremely good year for pig producers, starting with less supply than demand due to large sow culls in 2015 leading to stable high pork prices, low feed prices and a higher barrier for new farms, in the way of extremely tough environmental requirements. Although pork imports have increased by a factor of 1.2 from 2015 to 2016 to 1.5 Million tonnes, this level is still far from causing domestic prices to fall. So what can we expect from 2017? The central government is moving pig production away from built up areas such as Guangdong province, physically removing farms, while at the same time in some areas is giving subsidies for farms to be built in rural areas that have a less dense population and better access to feed crops, mainly the three provinces of the North East. A shift in pig populations from central and southern China to the north east and south west is happening. Apart from the locations of pig farming the scale is changing as well. Small family farms are being removed, this is due to either their location, too close to growing towns or non-compliance with environmental laws. The new farms are being built by large companies, only these have the funds and experience to build and run them. One resulting effect of this trend is that one common source of disease, which some smaller less professionally run farms are, is being reduced. Some producers that I have spoken to recently see this as a key point in the changing of the Chinese pig production industry. Another impact of no backyard farms could mean that farm labour on the bigger farms may be easier to recruit if bio security requirements can be reduced and farm workers are allowed to spend more time out of the farm after working hours. As the average farm scale increases, so should its efficiency and productivity. Both leading to lower production costs and lower and more stable pork prices in the long run. With the higher cost of entry pig farmers will look to improve efficiency in lean times against the current practice now of killing breeding stock and leaving the game when pork prices were low. With more professional farming it can be expected that heavier average slaughter weights will be achieved. More meat for the same fixed costs. After the current expansion plans are complete we can expect to see herd sizes remaining stable while pork production increases. As companies become larger then slaughtering their own animals will become more common. Branding of pork will also increase. More profit for the farms and a complete chain of traceability for consumers. The need for a prolific, easy to manage sow, with large litters and robust piglets will become even more important for these large producers. Genesus sees itself as being in the enviable position of being able to provide the right genetics for China and in 2016 almost half the breeding stick imported to China was from Genesus. 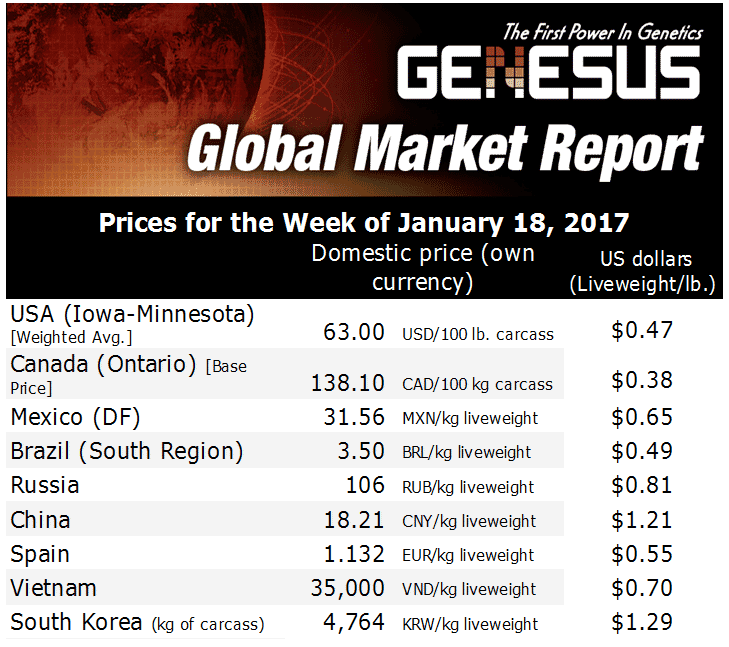 We see this trend continuing with the market share of imported GGP to continue to increase. With all the positives that come with larger scale pig production it may indeed be a bad ‘own year’ for the chickens but it’s looking good for the pigs!